Our UA College of Medicine – Phoenix Psychiatry Residency received notification of continued full re-accreditation from the ACGME, officially marking the Program's 47-year anniversary between Samaritan/Banner Health and our UA College of Medicine – Phoenix. The Psychiatry Interest Group, under leadership of UA College of Medicine – Phoenix second-year students Jasper Puracan and Savion Smith, organized a panel discussion on caeers in Psychiatry. Amanda Cattelino, MD, assistant clinical professor, Amelia Gallitano, MD, PhD, associate professor, Liz Baytion, MD, associate professor, and Jim McLoone, MD, professor, served on the panel. Nearly 30 students attended the event. Jasper and Savion will hand over the leadership batons to Hong Chen, Robert Yang, Julie Gehring and Sarah Fritzner for the 2019-2020 academic year. House Officer of the Year Award in Psychiatry was awarded by the Class of 2019 to Sondra Schultz, MD, of our UA College of Medicine – Phoenix Psychiatry Residency, recognizing her enthusiasm and exemplary professionalism as an inspiration to our Clerkship students. The Howard E. Wulsin Excellence in Teaching Award to Shehzad Ayub, DO, assistant clinical professor in Psychiatry and faculty attending at Banner – University Medical Center Phoenix. 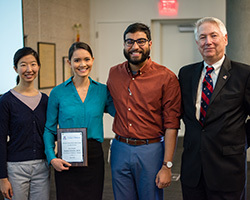 ​First place went to Larry Mecham, DO, UA College of Medicine – Phoenix Psychiatry Residency Program, Rachel Antol, UA College of Medicine – Phoenix third-year student, and Shehzad Ayub, DO, assistant professor, for their poster "Triptan-Induced Serotonin Syndrome." Honorable mentions were given to Yana Alekseeva, MD, Jeff Burrow, MD, and Larry Mecham, DO, UA College of Medicine – Phoenix Psychiatry Residency Program, for their poster "Oseltamivir-Induced Mania," as well as Jeff Burrow, MD, for his poster "Lithium Exposure through Breast Milk." Each of these posters was also presented at the UA College of Medicine – Phoenix Academic Excellence Day, where Dr. Burrow received a First Place Award for his case presentation. Khalid Khan, MD, a graduate of the UA College of Medicine – Tucson and currently a Psychiatry Resident at UCLA, and Maria Cheda, MD, a graduate of Pontifica Universidad and currently a Psychiatry Chief Resident at New York Medical College, have matched with our new Child and Adolescent Psychiatry Fellowship Program. Our faculty colleague, Ganesh Gopalakrishna, MD, at the Banner Alzheimer's Institute was recently certified in Geropsychiatry. Shao W, Ayub S, et al. QTc Prolongation Associated with Psychiatric Medications. J Clinical Psychopharmacology, Vol. 39, No. 1, January-February 2019. Bloom J, et al. Jail-Based Competency Restoration. J Am Academy of Psychiatry and the Law, 46:364-72 2018. Tariot P, et al. Randomized Trial of Verubecestat for Mild-to-Moderate Alzheimer's Disease. N Engl J of Med, May 3, 2018. Tariot P, Reiman E, et al. Association Between Amyloid and Tau Accumulation in Young Adults with Autosomal Dominant Alzheimer Disease. JAMA Neurol, February 2018. Burke A, Burke W, et al. Antipsychotics for Patients with Dementia. Current Psychiatry, October 2018. Burke W, et al. Methylphenidate for Apathy in Community Dwelling Older Veteran with Mild Alzheimer's Disease. Am J Psychiatry, February 2018.